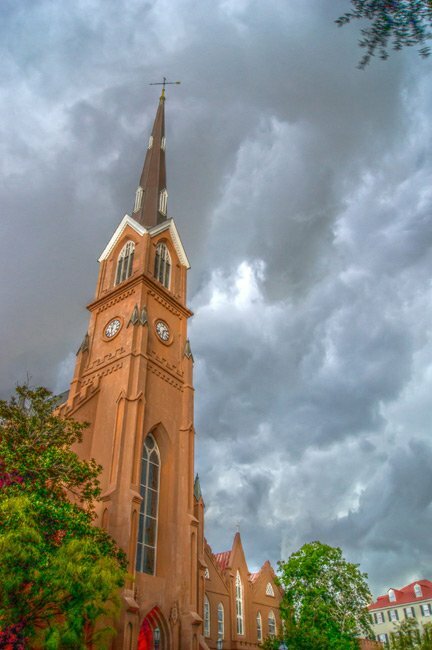 A fierce summer storms rolls through Charleston, creating an ominous gray background behind the beautiful St. Matthew’s Lutheran Church. The church was founded in 1840 primarily by German-speaking Lutherans from the English-speaking St. John’s Lutheran Church on Archdale Street. These Lutherans wished to worship in their native language. In 1842 the congregation’s first church, a Greek Revival edifice designed by noted architect Edward Brickell White, was completed at 48 Hasell Street. 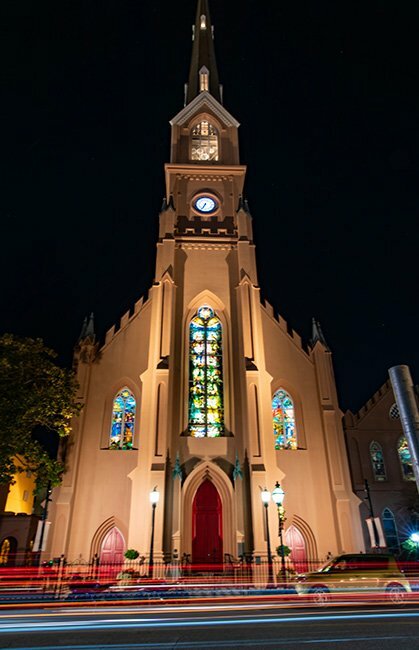 As the German community expanded in Charleston, the congregation eventually outgrew its first church and built this Gothic Revival edifice in 1872. The Hasell Street church is now occupied by St. Johannes Evangelical Lutheran Church. The city suffered an outbreak of yellow fever in the mid-nineteenth century. Sadly, the death rate forced the congregation to purchase land for a second cemetery, as the church’s burial grounds on Reid Street soon reached maximum capacity. St. Matthews bought 55 acres near the Cooper River to be used as Bethany Cemetery, and the church maintains the all-faith cemetery today. The Reid Street cemetery land, then called Hampstedt Cemetery, is now used for housing, and the cemetery’s remains were relocated to Bethany in 2009. St. Matthew’s Church is known for its 297-foot-tall steeple, which made the church at one time the tallest structure in the state. It remains the tallest spire in Charleston. In 1965 St. Matthew’s suffered a devastating fire that destroyed the steeple, sending it “crashing spectacularly into King Street.” The church was quickly rebuilt, including the spire, though a section of the spire remains where it landed as a reminder of the event. (Charleston Old and Historic District) Charleston played an important role in Colonial, Revolutionary, antebellum and Civil War America. The city was a major Colonial seaport, an active participant in the Revolution, a seat of rice and cotton culture and a leader of secession. Today much of the nation’s great social and architectural history can be visibly appreciated because of the great concentration of period buildings that still line the city streets. The historic district contains primarily residential buildings in addition to commercial, ecclesiastical, and government-related buildings. Several historic neighborhoods are included because of their concentrations of historically and architecturally valuable buildings. 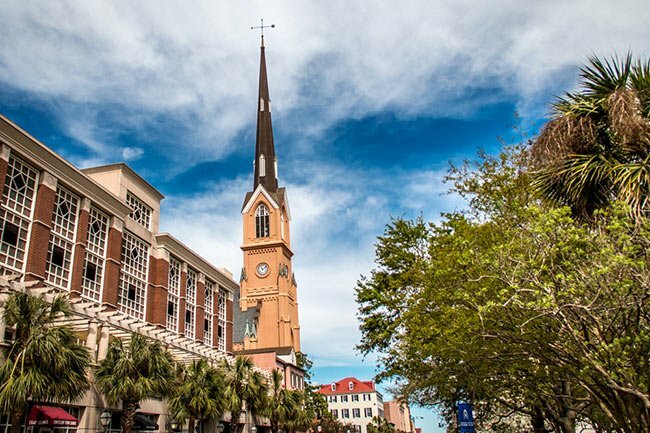 These neighborhoods possess the unique visual appeal of old Charleston, a picturesqueness created by the close proximity of buildings, in a wide variety of architectural styles. There is general harmony in terms of height, scale, proportion, materials, textures, colors, and characteristic forms, such as the side piazzas. All of the properties contribute to an expanded period of significance dating from 1700 to 1941. The great concentration of 18th and 19th century buildings give the district a flavor of an earlier America. The district contains many buildings of national historic and/or architectural significance. Built of brick, stucco, or clapboard, many of these properties are Charleston “single houses,” one room wide, with gable end to the street and tiered piazzas. Others are plantation style houses. Architectural styles include Georgian, Regency, Federal, Adamesque, Classical Revival, Greek Revival, Italianate, Gothic Revival, and Queen Anne, among others. The district also contains many outbuildings (stables, carriage houses, kitchen buildings), a majority of which have been altered extensively to accommodate modern needs.